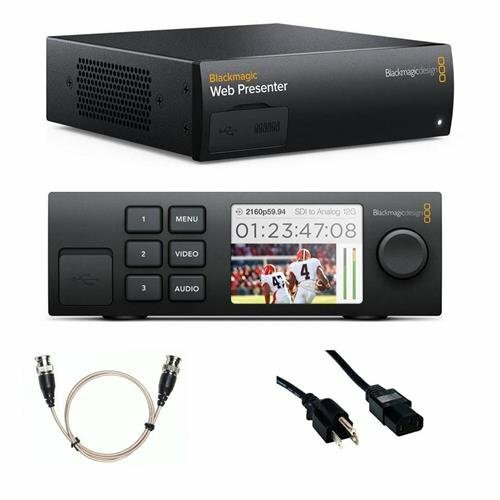 Blackmagic Web Presenter Review (2018) – after almost 2 years of hard use, is it still worth live-streaming at 720p? Ok: this sounds like a non-issue since many of us watch videos on our tiny smartphone screens. But I always want to stay ahead of the curve and didn’t need much of an excuse to re-visit my live-streaming setup to see if 1080p livestream was ready for prime time. Sure Facebook currently only allows 720p streams for most mere mortals like myself. But Youtubers are pushing the limits with some streaming at 4K!!! I live in Canada without hyper-speed optic fibre internet, so thought streaming at 1080p would be all I could safely attempt. So I bought the AJA U-TAP SDI and used my Blackmagic Web Presenter (with Smart Panel) as a 2-channel switch to feed a clean 1080p SDI into the AJA. 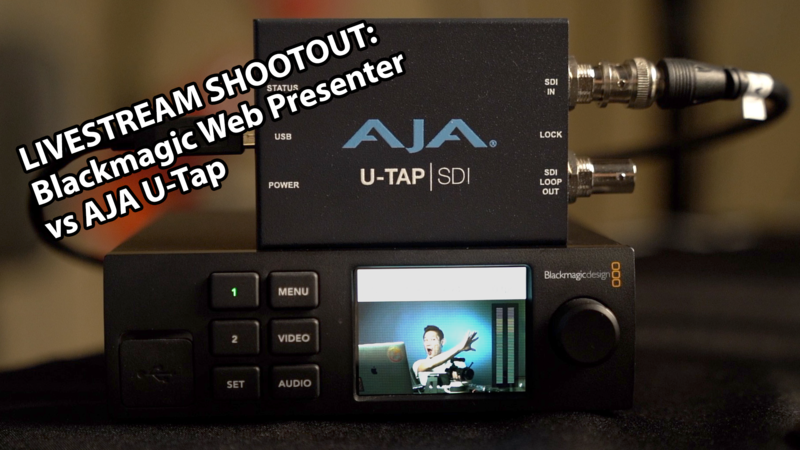 From the AJA U-Tap, a single USB 3 cable both powers and gets the SDI video/audio signal into my computer to both record and stream flawlessly to the inter webs. That was the theory at least. Sadly it wasn’t as fool-proof or easy for me to stream at 1080p as I had hoped. 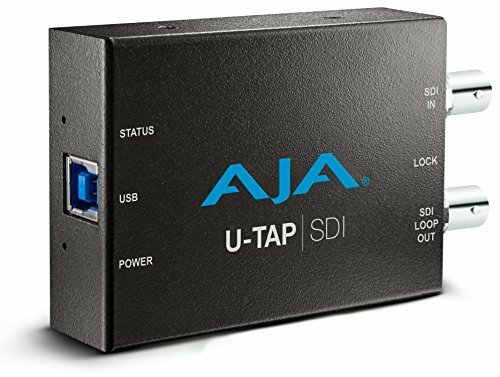 AJA U-TAP SDI model can receive Blackmagic Web Presenter SDI Program Out that allows me to receive the clean SDI video/audio signal from the BMWP prior to being down-scaled to 720p. Especially useful when using the optional Smart Panel on the BMWP for 2-channel switching. Setup was not seamless: Blackmagic devices default to SDI “A” vs “B” standard, and the AJA requires a “B” signal. This required a call to Blackmagic tech support. After a quick update to the firmware in my Blackmagic micro converters, the AJA video showed up nice and clean on my computer. Not hard, but not plug & play at least for my system. Recording 1080p straight to computer in Screenflow app uses H264 codec which makes skin tones look ruddy compared to OBS’ x264 which I prefer. Though the AJA isn’t the all-in-one 1080p streaming and computer video capture box I was hoping for, I’m keeping the AJA U-Tap to record from my video cameras straight to computer in 1080p. When used with the 2-camera switcher of the Blackmagic Web Presenter (with Smart Panel), this streamlines my workflow for creating my videos with the only down-side being my computer fan noise. If you need a way to get great 1080p into your computer, the AJA can do that without issue. So long as you can spare the CPU usage and don’t mind the hum of your computer’s fan, it’s a keeper. But for streaming, I’m sticking to my tried and true Blackmagic Web Presenter for rock-solid livestreaming. It’s hard to be sure where the breakdown in my testing of 1080p livestreaming with the AJA is. Is it OBS requiring too much CPU to process the AJA input? Or is spotty Canadian internet the culprit for the streaming issues I saw? I’m open to suggestions and would love to hear from you and your experience with streaming at 1080p and beyond.